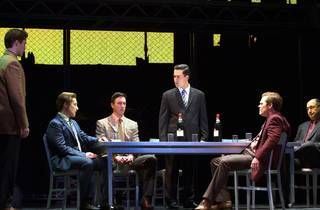 This is a review of the 2018 Sydney season of Jersey Boys. 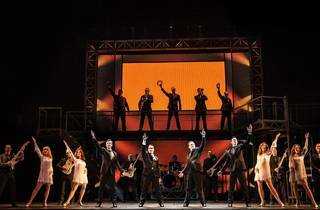 When Jersey Boys won four Tony Awards in 2006, it changed the shape of commercial musical theatre worldwide. 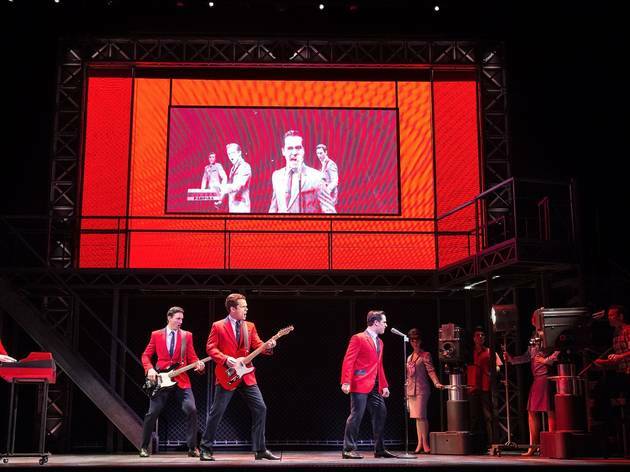 Between it and the runaway success of 1999’s Mamma Mia, the jukebox musical – a narrative piece of theatre woven together with an artist or band’s discography – had critical acclaim and a new degree of artistic legitimacy to go along with hordes of nostalgia-happy fans. 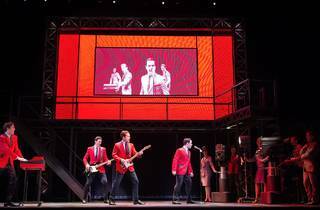 The bio-jukebox musical – a show that uses an artist’s music to tell its life story; a Behind the Music with jazz hands – wasn’t a new form on Broadway, but it became the hot new property after the 2006 Tony Awards, and Jersey Boys’ flashback-framed, milestone-hitting framework became the gold standard approach. We already loved these show here in Australia (home-grown hits like Shout! 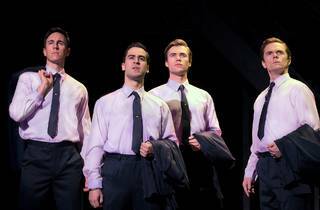 and The Boy From Oz pre-date Jersey Boys), but you can see Boys’ narrative, structural legacy in plenty of shows that have toured Australia since Jersey Boys first landed here for a staggering four-year run in 2009. 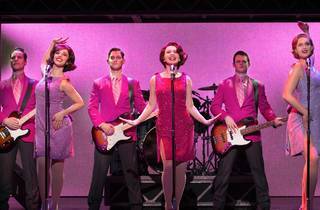 To name a few: Georgy Girl: the Seekers Musical; Beautiful: the Carole King Musical; Dream Lover: the Bobby Darin Musical. 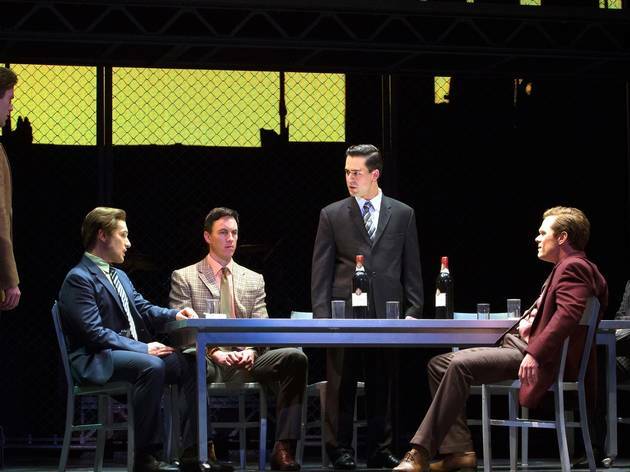 Now Jersey Boys is back in Sydney. 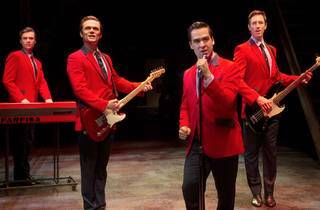 It’s a victory lap of sorts for the show that changed the musicals we, half a world away from Broadway, get to see. Does it still hold up? For the most part, yes. 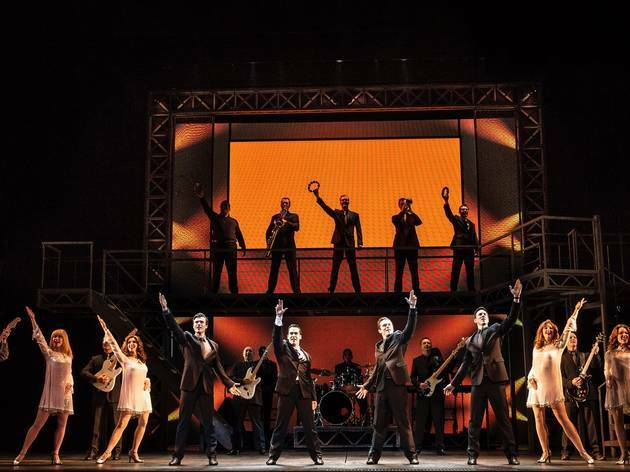 The success of Jersey Boys has always been down to its structure: it’s a well-oiled machine of storytelling. 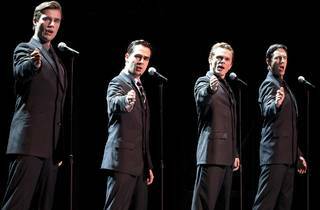 Book writers Rick Elice and Marshall Brickman allow each member of the Four Seasons to act as a narrator (one Season for each season, as it were), giving different perspectives on what life inside the rise and fall of the group was actually like. This direct-address approach helps keep the action humming along with surprising pace. 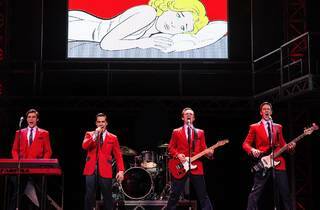 And, crucially, the show uses the Four Seasons discography with welcome precision: it takes us more than half an hour to hear game-changing tracks like ‘Sherry’ or ‘Walk Like a Man’, and the show’s restraint in building the story without sneaking in a hit is impressive. The book, however, is more than a decade old now, and its weak spots are starting to show. It’s quippy and efficient – it clearly works – but it’s also shallow. There are only three women onstage (Mia Dabowski-Chandler, Cristina D’Agostino, and Mackenzie Dunn, all delivering) and the multiple roles they play are painted with broad, lazy strokes; certainly, the book’s misogyny is true of the era of the show, but more care and nuance could have been taken to give women more voice than that of the nag, the flirt, or the temptress. 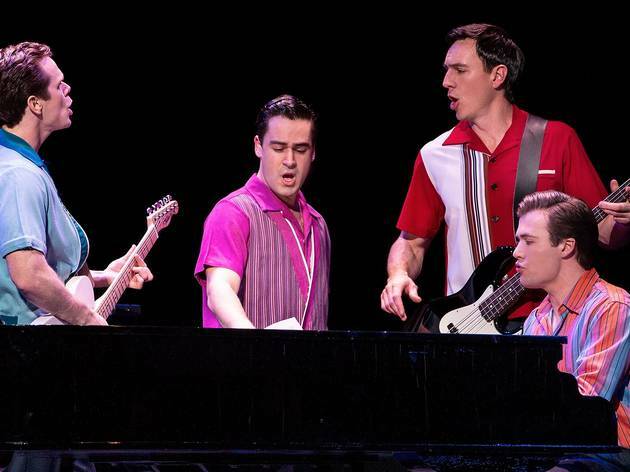 But this is a show that doesn’t grant nuance to anyone except the Four Seasons: Tommy DeVito (Cameron MacDonald), a hustler with mob ties and a gambling problem; Nick Massi (Glaston Toft), the musical genius who walked away from the group at the height of its success; Bob Gaudio (Thomas McGuane), the secret weapon songwriter whose legendary handshake deal with Frankie Valli has kept them as friends and collaborators for nearly 50 years; and Frankie Valli (Ryan Gonzalez on opening night), the singer with the voice of an angel. 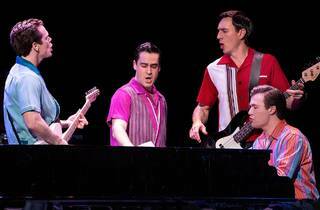 This is a solid quartet and they make what matters in this show the most – the music – soar. Gonzalez is a bona-fide star as Frankie, with a supple voice that delivers all the falsetto you could want, and a sensitivity that sells the story beyond what’s written in the script. He’s nicely matched by McGuane’s Gaudio, who brings necessary freshness and lightness to a stage full of performative New Jersey masculinity. MacDonald is still settling into DeVito’s exhausting swagger, but he comes to life against Gonzalez; their tension is genuinely absorbing. And Toft is their anchor as the long-suffering Massi (he played the role more than 1,000 times in its last Australian run and his comfort with the role shows – he brings surprising heft and self-awareness). 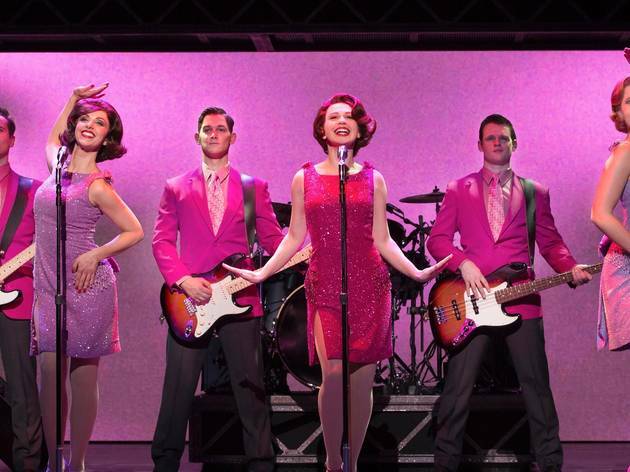 The production as a whole feels a little like it’s still finding its feet outside rehearsals – the opening number was especially undercooked on opening night, and performances took some time to calibrate and settle. 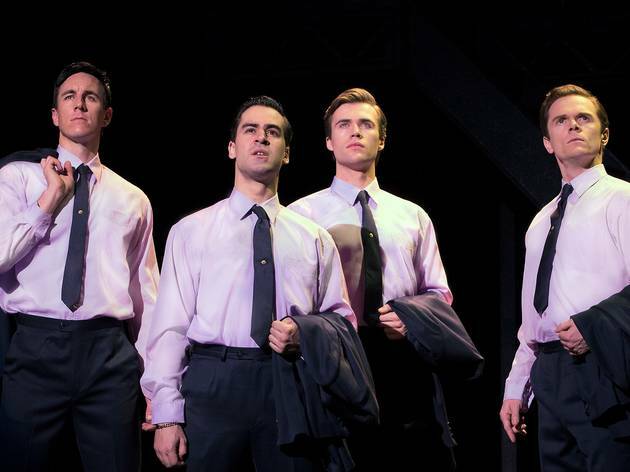 But these problems will disappear as the run continues, and the songs that matter most to audiences – ‘December 1963 (Oh, What a Night)’, ‘Can’t Take My Eyes off You’, and ‘Big Girls Don’t Cry’ still achieve necessary lift-off. Luke Hunter’s musical direction is strong, and after a bumpy start on opening night, the band summoned all the nostalgia you could hope for in a show like this. This is a workmanlike show that cuts to the chase – its set is minimal and industrial, its dialogue is more combative than it is poetic, and it calls for performers that can create larger-than-life facsimiles of larger-than-life men, and then maybe make you remember past loves and losses with a perfectly-timed number from days gone by. It’s slick and perhaps more soulless than you remember, but that’s okay – the soul is still there in the songs. 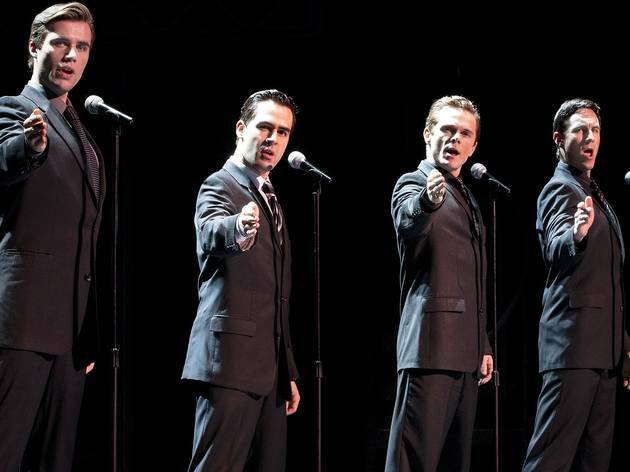 And so, if you’re a Four Seasons fan, is yours. The folks on each side of us had seen the show four times over the last four years and we had seen it three times. This was easily the worst show we all have seen. The sound was badly mixed all night. At times Frankie Vali’s voice was lost in the mix. The spoken words were blurred and unclear and the actors could have bees speaking Swahili for all the sense it made. The vocals of the lead singer of the girl group were totally unintelligible. We knew the song was My Boyfriends Back because of the ‘Hey La Hey La’ but the rest was mush. The sets were drab and uninteresting and the costuming bland. 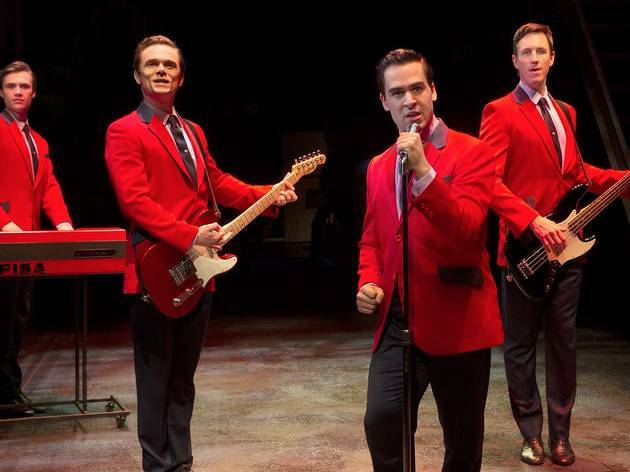 Where were the colourful jackets the Four Seasons always wore, where were the colourful sets to reflect the era and where was the uplifting experience the group reflected in their music. We wished all night the actors both male and female would stop wandering up and down the bloody staircase and across the ramp and disappearing into the wings. We wished that the gray suits could be consigned to the local Opp Shop. Having said all that, the energy and passion was evident in all the performances and performers. It is often said by singers that they are at the mercy of the ‘Sound Tech’ and this was well proved tonight. 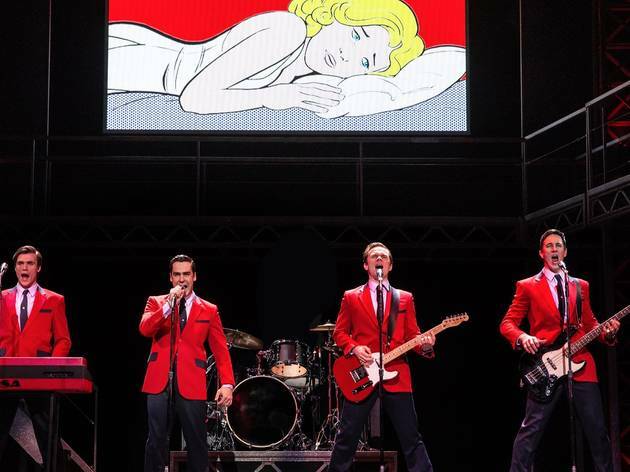 The set director needs to take a long hard look at the drab, sour stage set he has designed and realise that the Four Seasons came from that kind of background but left it well behind when they had their first hit record. Go see the show for the energy of the four lead players and the music of the backing group these are only things worth the price of admission.